The Troodon is very well known in the scientific community for possessing the highest brain-weight to body-weight ratio of any mature dinosaur, Troodon is a small maniraptoran, comparable in size to Velociraptor at six feet & 45-50 kg (110 pounds). 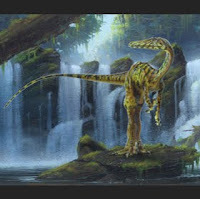 Troodon gives name to the troodontids, the twin sister of the dromaeosaurids (Again, containing Velociraptor). Troodon fossils have been found in Antarctica, bolstering support for the theory that certain dinosaurs were warm-blooded. Large eye sockets also suggest Troodon was adapted to its darkened environment. Had it existed in Antarctica it is the largest Antarctic dinosaur, in contrast to most of the rest of the world where the largest dinosaurs were invariably herbivorous. Troodon's above mentioned relatively high brain-weight to body-weight ratio is often regarded as an indicator that Troodon was the most intelligent of the saurian dinosaurs; however it is a myth that the brain-weight to body-weight ratio is a measure of intelligence. It has been shown that although humans are the most intelligent of any known animal, mice in fact have a higher brain-weight to body-weight ratio. At the time of writing, there is no known measure of intelligence that can be observed only in the body of an animal.